Pizza Pomodoro is a small Italian pizzeria based in Leeds street Wellington. Famous for their hand-rolled Neapolitan pizza, baked fresh in their wood-fired oven. They specialise in square, wood-fired gourmet pizzas. A company brand, promotional brochure, and packaging were designed. Project: Brand and Business Stationery, Brochure and Packaging. Format: Square three panel folded brochure. Brief: To come up with a funky, unique brand which included a mascot. 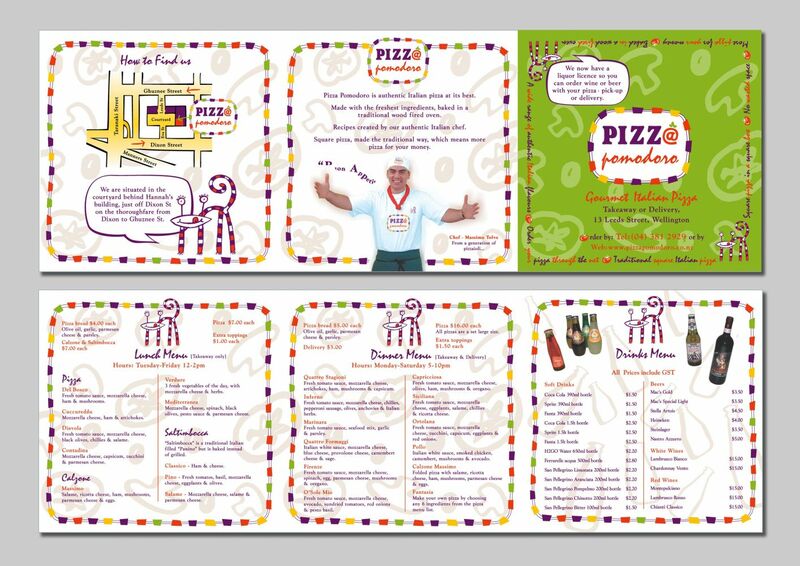 The brochure had to promote Pizza Pomodoro’s exceptional range of quality pizzas. Solution: The logo has a combination of fonts standard serif font and a freestyle font. The striped edges are designed to look organic like they are pieces of food. Brief: To create packaging that links to Pizza Pomodoros brand, with a tactile homemade feel. 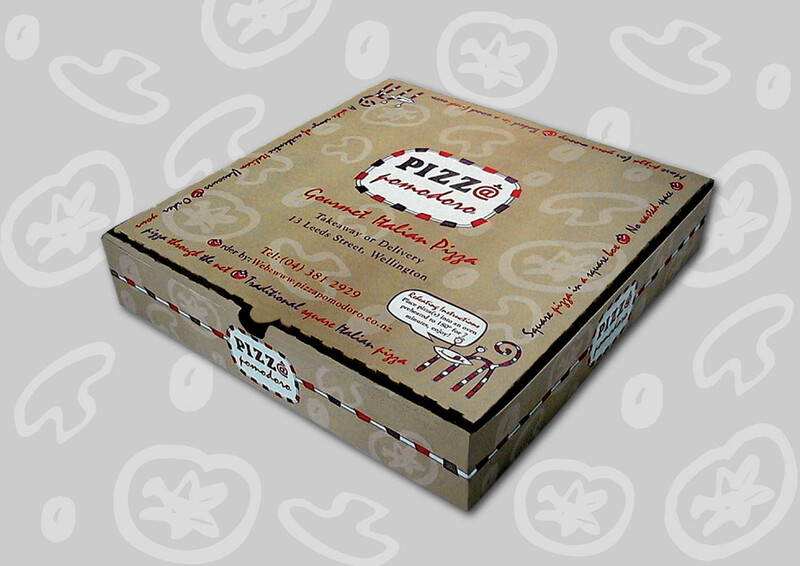 Solution: A simple square brown cardboard box printed with two colours the logo on the front and a textured background of scattered illustrated pizza toppings. Brief: To come up with a funky, unique brand which included a mascot. 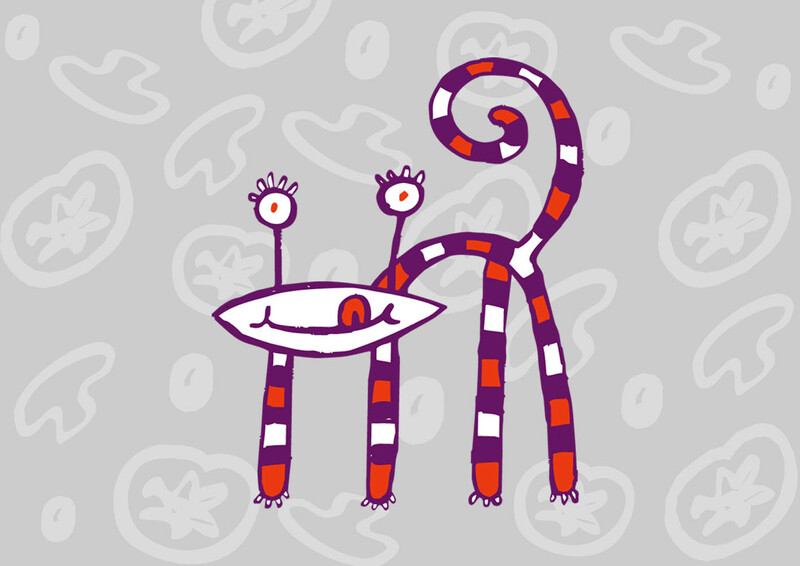 Solution: The mascot was a funky illustration of a strippy pizza cat monster. An organic stripey border was also illustrated as well as the background scattered topping texture.